At Bricko, we are committed to providing the best organic products for all your yard and gardening needs. The quality of our materials and effectiveness of our formulas are unsurpassed. And we guarantee, when used as instructed, our products will produce the biggest, healthiest plants you have ever grown, or your money back. 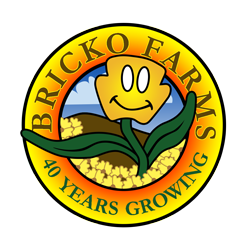 Bricko Farms made its start in 1977 with Compostost® Breakfast for Flowers, a compost we make on a giant scale. We are the largest commercial custom compost production site in the Southeastern United States. Even though we turn out thousands of tons per year, our organic plant food is produced using the same trusted method experienced gardeners have made at home for years. We just have a bigger pile. Gardeners who visit us down on the river confess to acute envy attacks when they see our operation. While we usually have various crops that are green and growing, the major crop at Bricko Farms is compost. Yes, compost! Our founder, Ltc. Bill Bricker (ret.) began making what became our premium growing food with nature’s help more than 60 years ago for his home garden. Along the way, we figured out a way to do that in volume for a good many others. Bricko: Growing on Forty Years! It Began With An Idea: This family-owned enterprise started in 1977 with leftover, wired-together, junk-caliber equipment on a 10-acre site found on the banks of the Savannah River. After we acquired the land, next we looked around for sources of compost material. We had the formula and the mission. But the one thing we did not have was money. Beginning with a couple of old trucks, strong backs, enthusiasm, and the spirit to succeed, we began to spread the word about our product. Our founder had this vision of selling one bag to every household, so we got busy and asked for donations. Fast forward to today, and you'll find after nearly four decades of continual growth and success, some things are different. However, the process is remarkably the same. The equipment is more up-to-date; books are kept on computers; we can turn a pile faster and more efficiently; and our volume increases year by year. But it still comes down to 30 days with the right combination of raw material letting the organic process transform waste into the grower’s best friend. The Next Generation: We knew way back when that if we could mirror Nature’s Way, only make it faster with the right conditions, we could bring this great growing mixture to market. We have been doing it for 40 years now, and we have no plans to stop. Bill’s youngest of three sons, John, has been at his father’s side all along. Since the age his dad was when the business began, John started and continues running the company with the same committment and philosphy we've always had. People need plants. Plants need food. At Bricko, we make the best there is. That’s easy. As avid gardeners, we know compost is Mother Nature’s most perfect garden food. Walk out into a deep virgin forest some warm afternoon. Look at the way nature is improving the soil as she gets rid of last years’ dead leaves, decomposing tree trunks, and old foliage. Pick up a handful of rotting leaves, and smell the warm and wonderful scent of the natural breakdown of vegetative matter into humus. This process, if left alone, takes years to result in the rich, black-brown humus, which loosens, enriches, and enhances the soil below.